With a population of 24 million, this city is the New York of Asia. Skyscrapers, food markets, green space, shopping centres and always something to do. Thanks to the new visa arrangement, you can spend up to 132 hours in Shanghai without a visa which can be very hard and expensive to get. 48 hours is enough in Shanghai because it’s certainly not cheap. Ok Aussie’s take advantage of this visa arrangement asap. Here is what we did. Hidden Garden International Youth Hostel; we got a private room and it was perfect. We had 2 nights, could check in early and leave our bags there after check out. It was close to the metro and was enough out of the centre to not be busy. The rooms are small but we paid $50 US for 2 nights compared to $400 in the Bund. The toilet and shower are clean but tiny, but it was enough for us. O’Mills Bakery; Aussie brunch and healthy little haven with raw cakes, peanut butter banana bread, homemade Kombucha and homemade artisan bread. It is great. They have wifi which is uncommon for China and they also speak amazing English. Imperial Treasure; amazing Dim Sum brunch with heavenly steamed buns filled with molten, sweet and salty egg custard. Wait until they have cooled down before you burn your mouth and ruin your tastebuds. Xie Huang Yu; this local place is awesome. It’s a noodle soup shop specialising in yellow croaker noodle soup which is bright yellow and delicious. Go early so you don’t have to wait ages. Order from the menu with pictures and English words which is handy. Order lots the food was oh so good. We got the crumbed chicken, cooked greens, crab meat wonton yellow croaker soup and the chilli pork noodle soup. Slurp Yunnun Street Food; healthy gluten free noodle soup shop with lots of choices for the health conscious. RAC; crepes, coffee and brunch. Loved this place. They had awesome brunch meals and great oat milk flatwhites. Very cool interior design. Heaven on Earth; high end expat spot with a great view. Mr and Mrs Bund; is another great spot on the waters edge. The Bund; go for a stroll to check out the view across the Bund. 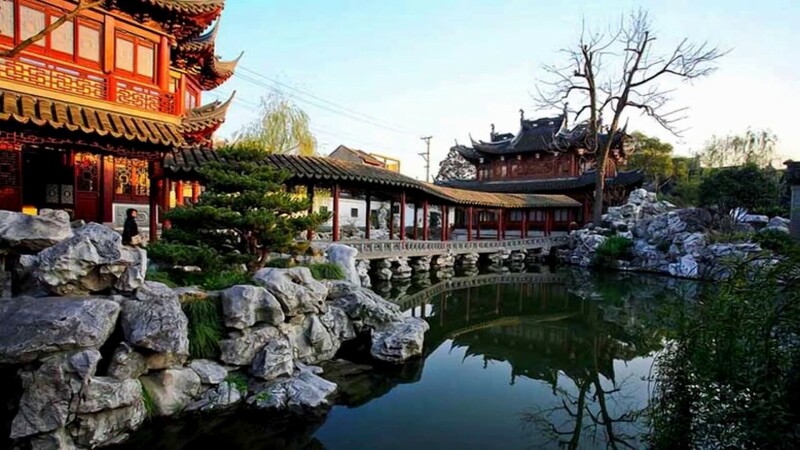 Yu Garden; authentic (but busy) Chinese enclosed garden with beautiful buildings and shops. Join the line of people and slowly meander along the bridges over the water. Lots of local food stalls and shops to wander through too. Xiantidi; A converted patch of the old French Concession area full of swanky stores, restaurants and bars, Xintiandi could almost be a corner of a cosmopolitan city tucked into the centre of Asia’s hottest boomtown. It’s expensive. Tian Zi Fang; located in the Old French Quarter just off the main road you’ll get lost in this crazy bustling street food and market stall maze. Awesome taste testers, delicious food and craft handmade nicnaks – we loved this place. Nanjing Lu; One of Shanghai’s many shopping streets, Nanjing Lu is the one where everyone heads first. It caters for a mainly Chinese clientele rather than tourists or expats, and so is a good place to watch the Shanghainese at play. Zen Massage; this was the best massage of our life. The Chinese know a lot about alternative medicine and this massage was legit. If you have tension or knots they know exactly what they feel and can sort you out. It’s the opposite of a weak oily wipe over you get from inexperienced places. You’ll need a massage after all the exploring! MONEY; Shanghai used the Chinese Yuan. You can’t use your credit card in most places in Shanghai. The locals all use an app on their phone for paying for everything. Unfortunately without a Chinese Sim you cannot access this. Withdraw cash and take it with you for the 2-3 days. Our revolut travel money card worked but on limited ATMs only so do some research. GETTING AROUND; Google doesn’t work in China so you won’t have google maps to get around. The subway system is great and really easy to use. You can buy a travel card and load cash onto it. It is about 4 yuan per trip. Uber also doesn’t work. Use their local app called DiDi. Download it before you go. LANGUAGE; The language barrier can be tough for Western travelers. The girls at our hostel were great for helping us out ordering taxi’s etc and with directions. Print screen everything when you’re on wifi at your hotel before you set off for the day. WATER; you cannot drink the water in Shanghai so make sure you buy large water bottles from the supermarkets to drink and make tea and coffee out of if you have a kettle in your room. SECURITY; is high in Shanghai and there will be security checks at subway stations, train stations and any popular places. Make sure you have nothing in your pockets that might trigger the x-ray machine like keys or coins. Ok so that will keep you busy! Enjoy Shanghai ! Indulge yourself in their culture. It really is a beautiful place.